A pivot variable is saved with the subject area. You can use it in multiple pivot tables and in controls on dashboards. 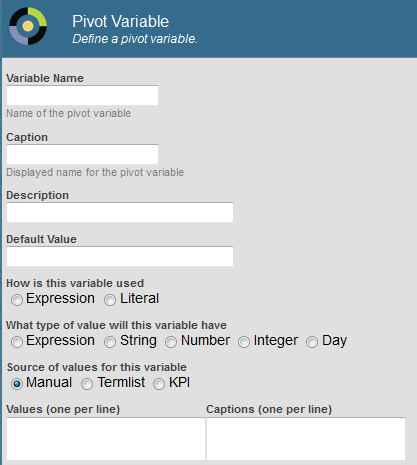 Pivot variables provide another way for your end users to interact with your dashboards. A name, which is not case-sensitive. A default value, for use when the user has not specified a value for the variable. (In most cases) A set of allowed values for the user to choose among. These values are generally MDX identifiers, MDX expressions, or literal numbers or strings, depending on precisely how the variable is intended to be used. Pivot variables are generally intended to be used in pivot tables. Specifically, when you create a pivot table, you can use pivot variables in selected parts of the query that defines the pivot table. When a dashboard displays the pivot table, that dashboard can include a pivot variable control, with which the user can change the value of the corresponding pivot variable. The system simply substitutes the given value into the query, executes the query, and then redisplays the pivot table. Similarly, when you access a dashboard via a URL, that URL can include parameters that specify the value for pivot variables used in pivot tables on the dashboard. Before displaying the dashboard, the system substitutes the given value into the queries and executes the queries. Click the Add Pivot Variable button . For Variable Name, type the logical name of the variable, to be used internally. The logical name must contain only alphanumeric characters. The name is not case-sensitive. Note that you cannot create multiple pivot variables whose names differ only in case. Caption  Specify the display name of the variable. The default caption is the logical name. Description  Specify a description. Default Value  Specify the default value. The best practice is to specify a default value so that the system has a valid MDX query for any pivot table that uses this variable. For information on the kinds of values to provide, see “Expression Pivot Variables” and “Literal Pivot Variables,” later in this chapter. Expression  Select this if you intend to use this variable to represent an MDX expression. Literal  Select this if you intend to use this variable to represent a literal number or string, for use within an MDX expression. For details, see “Expression Pivot Variables” and “Literal Pivot Variables,” later in this chapter. What type of value will this variable have  This option affects the default style of the control used when you add a pivot variable control to a dashboard. Manual  Select this if you want to provide a hardcoded list of values, if you want to display a calendar control, or if you want the user to type a value. To specify a hardcoded list of values, specify Values and (optionally) Captions. For Values, specify one value per line. For Captions, specify the corresponding captions, if any, with one caption per line. In this case, the pivot variable control displays your list of options. To display a calendar control, select day for What type of value will this variable have. In this case, the pivot variable control is a calendar control. To enable the user to type a value, do not specify Values or Captions. 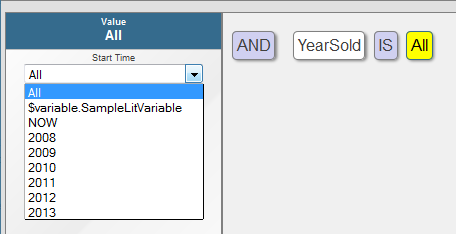 Also, for What type of value will this variable have, do not select day. In this case, the pivot variable control is a simple field into which the user can type a value. Termlist  Select this to use a term list to provide the values. If you select this, click the Search button and then select a term list. For each item in the term list, the system uses the item value as the value and uses the item key as the corresponding caption. The pivot variable control displays your list of options. KPI  Select this to use a KPI to provide the values. If you select this, click the Search button and then select a KPI. The KPI should have a property called Value. For each series in the KPI, the system uses the Value property as the value and uses the series name as the corresponding caption. The pivot variable control displays your list of options. In all cases, for information on the kinds of values to provide, see “Expression Pivot Variables” and “Literal Pivot Variables,” later in this chapter. 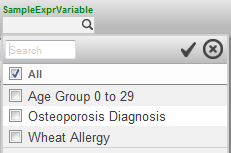 The new variable is then displayed within the Pivot Variables section in the Model Contents pane. An expression pivot variable represents an MDX expression. For How is this variable used, select Expression. For Default Value, specify an MDX expression. For Source of values for this variable, either specify a hardcoded set of MDX expressions or select a term list or KPI that returns a set of MDX expressions. See the next subsection. See the comments after this table. Notice that the member references are separated by commas, and the expression is enclosed in parentheses. Notice that the member references are separated by commas, and the expression is enclosed in curly braces. You can omit the square brackets for any identifier that contains only alphanumeric characters and that does not start with a number. Also, you can omit the hierarchy and level names if the member name or key is unique within this dimension. To use an expression pivot variable in a pivot table, drag and drop the variable into Rows, Columns, or Filters, as applicable. In each case, the Analyzer adds a control to the filter bar so that you can test the variable. See the example. A literal pivot variable represents a literal string or numeric value to be used within an MDX expression. 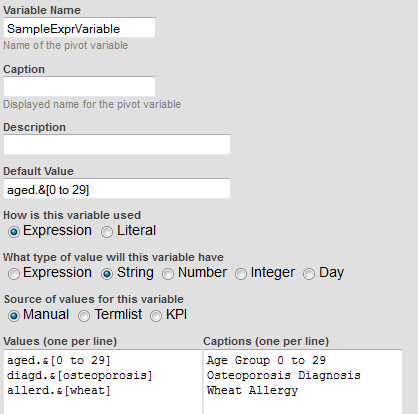 Depending on how you define a literal pivot variable, you can use it within the Advanced Filter Editor, in calculated members, or in manually written MDX queries. For How is this variable used, select Literal. For Default Value, specify a fragment suitable for use in an MDX query. For Source of values for this variable, either specify a hardcoded set of values or select a term list or KPI that returns a set of values. See the next subsection. A literal pivot variable has a literal string or numeric value. In the most useful scenario, the variable is intended to represent the last part of a member identifier, and you use it in the Advanced Filter Editor. In this scenario, any value for the variable should be a string of the form &[key] where key is a member key. For example: &[0 to 29]. (See “Finding the Key for a Member,” earlier in this book.) See the example later in this section. In another useful scenario, the variable is intended to represent a number that is used as a multiplier or other formula element. In this case, you would use the variable within the definition of a calculated measure. To use a literal pivot variable in a pivot table, use the Advanced Filter Editor. When you add a condition, select a level. For the value for that level, select the name of the literal pivot variable. See the example, next. The item $variable.SampleLitVariable is the pivot variable. The other items are the members of the YearSold level. 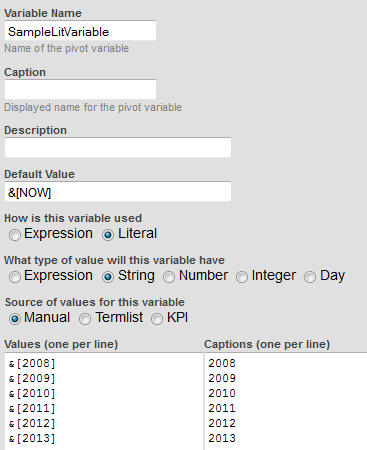 Note that all the pivot variables are available in all the value drop-downs in the Advanced Filter Editor. The $variable.SampleLitVariable variable is suitable for use only with one level in this case  the YearSold level, because this is the only level that has members with the keys 2008, 2009, and so on. Select the pivot variable in the Model Contents pane. Click the Pivot Variable button .